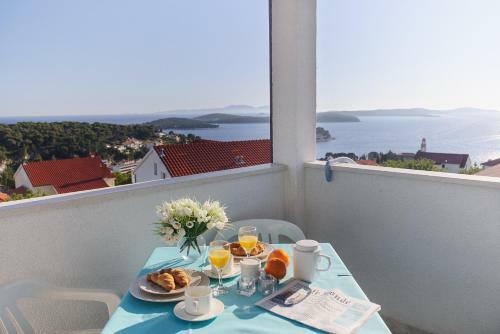 Boasting breathtaking views of the Adriatic Sea and the Old City of Hvar, Apartments Sea Breeze enjoys an elevated position, 600 metres from the main plaza and the Basilica. Each accommodation unit comprises a well-equipped kitchen and a living area with lcd tv. The closest dining establishment and a grocery store can be found 300 metres from the property. The Hvar presents many cultural landmarks for instance the Francescian Abbey, the Citadel and the Cathedral. Uvala Lozna ( ~ 3.2 km ): 15+ apartments. Milna (Hvar) ( ~ 3.6 km ): 46+ apartments. Selca ( ~ 9.6 km ): . Sveta Nedilja ( ~ 11.8 km ): 24+ accommodation units. Beach Momo, Hvar ~ 1,2 km from Apartments Sea Breeze Gravel beach: ideal for families, recommended for young people, with restaurant, with caffe bar, equipped with showers. Excellent choice of watersports. Beach Jerolim ~ 1,5 km from Apartments Sea Breeze Rocky beach: with restaurant, with caffe bar, equipped with showers. Excellent choice of watersports. Nudism is allowed. Beach Mekicevica ~ 1,8 km from Apartments Sea Breeze Rocky beach. Nudism is allowed. Beach Pribinja ~ 2,6 km from Apartments Sea Breeze Gravel beach: ideal for families. Beach Borca, Milna ~ 2,7 km from Apartments Sea Breeze Rocky beach. Restaurant Mustaco , Hvar Guest reviews: 7,2/10 ~ 0,9 km from Apartments Sea Breeze Address: Pokonji dol, 21450, Hvar. Restaurant Pizzeria Mama Leona, Hvar ~ 0,7 km from Apartments Sea Breeze Cuisine: Pizza. Restaurant Buffet Pizzeria BEPO, Hvar Guest reviews: 8,4/10 ~ 0,4 km from Apartments Sea Breeze Address: Krizna luka bb, Hvar. Restaurant Lungomare Hvar, Hvar Guest reviews: 8,5/10 ~ 0,3 km from Apartments Sea Breeze Address: Veljka Kovacevica 20, Hvar. Cuisine: Croatian cuisine. Restaurant Vartal, Hvar Guest reviews: 8,4/10 ~ 0,3 km from Apartments Sea Breeze Address: Fulgencija Careva 1, Hvar. Cuisine: Croatian cuisine.